Since I stepped off the plane in this beautiful Southern city of Huntsville, Alabama, all I've been doing is EATING! I am so full! I been eating too much, fa real! I think I'll return to Hawai'i about 'fitty' pounds heavier! Other than eating, I also been doing a whole lotta family history. I knew I would be. On Monday, my husband found an old trunk that belonged to his grandfather. 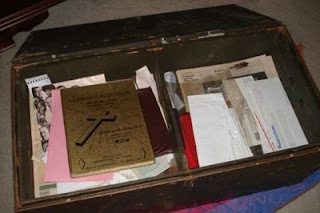 For those not familiar with the hobby of genealogy, an old trunk is a gold mine of information. Whew... the trunk was full of old pictures and all sorts of legal paperwork. I was able to plug in all kind of information into my family tree. 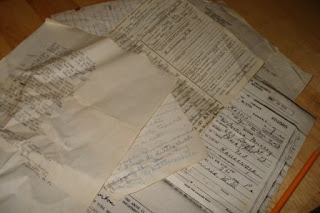 There were death certificates and birth certificates and military records, and tons of photo's and names. It was pretty amazing! Also, with the help of Ancestry.com, I was able to correspond the names I found with the United States Federal Census. It has been an AMAZING experience! 1. Slaves were counted as possessions, like cattle, and were not enumerated as people. They were property, counted as assets for slave holders! What this means for genealogy researches like myself is that the slaves will not be "named" in the U.S. Census. 2. Slaves were thoroughly and effectively weaned from their culture in the most abrupt manner. They were severed from their culture and severed from other slaves that shared the same culture. I think we know what the implications of that would be. Effectively "colonizing" the African to be English-speaking American's! 3. Effectively "colonizing" Slaves meant they had to take on "Christian" names as ordered by the slave holder. This was to turn the slave from a heathen into a Christian. What this means for genealogy researchers is that we will have a tough time making the link to Africa. Well, thats what I've been doing with my extra time. I love it. I love making the connection to the past. It's pretty amazing what I've been able to find and then be able to share with my inlaws. They are thoroughly excited as well. Hope your new year is off to a great start! Wish you the best for 2009! Jackpot! I wish I could find something like that to help me in my quest on recovering family history files. Anyway, we missed you on New Years but kept you in mind while blowing up Hau'ula and contemplated lighting the christmas tree on fire!